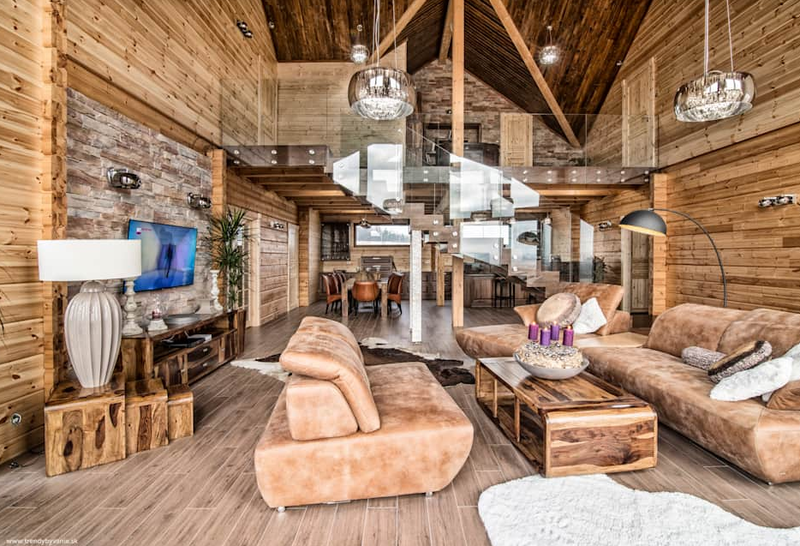 Log cabin house has always been synonymous with nature in that the interior designs always harness the power of natural materials – woods and stones. But it does not mean that log cabin houses are monotonous. 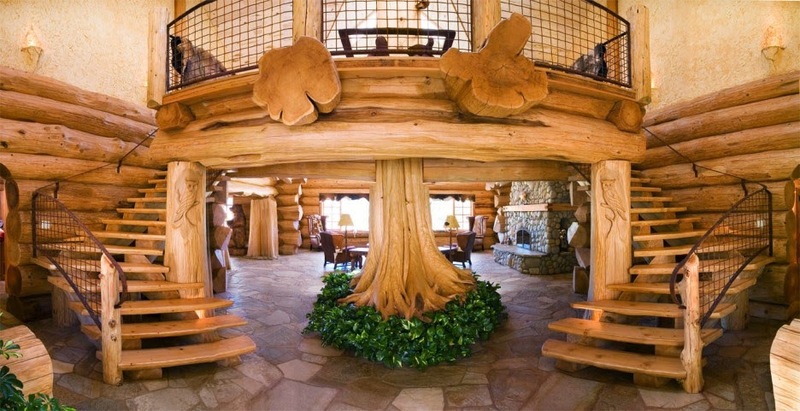 Check out these 10 impressive log cabin interior designs that can make you gobsmacked. Having a large living room is such a great idea because it can accomodate more guests so that you can have a great time together with your family, friends, and colleagues. However, a large living room needs an impressive look that brings positive vibes throughout the room. The living room is occupied with big and comfortable sofas. Some of them are made of leathers while some others are made from fabric. They sit perfectly in the middle of the room to provide an ultimate comfort to the guests. The most noticeable thing in this living room that draws everyone’s attention is the unique chandelier made of antlers. It produces subtle lighting that makes the living room look warmer. And don’t forget the hefty beamed ceilings and and large rounded wood logs for the main feature. Log cabin houses are usually built by the lakes or in the mountain areas. But, today, log cabin houses can also be found in suburban lifestyle. People who live in suburban areas tend to use modern interior design. However, you can still add the classic of log cabin in your modern house by concocting some of their features. Since it is a log cabin house, the walls and floors are made of groove-wood panels. You can find the touch of modern style in the glass handrails and pendant lighting that complement the wooden interior without overlapping it. You can’t find huge logs in this kitchen, yet you can still feel the log cabin interior design has influenced this modern house. The glossy wooden flooring gives the effects of sleek look to the kitchen. And so do the well-finished walls and ceilings. Their smooth and even texture spruce the house up. The color scheme also plays a crucial role in creating nuannce. Most of log cabins look rustic due to the dark brown logs. This kitchen, however, use lighter brown hues and clear-cut furniture for a more modern look. A log cabin house does not have to expose huge logs with rounded panels despite the name. You only need to include the basic material of this type of house – woods. And don’t forget to make it as authentic as possible. This house is not big enough so that there is not enough space to adorn it with astronomical logs which can make it more cramped. Now, get rid of those huge logs and use groove-wood paneling for he walls, instead. Pro : The floor is covered by carpet. It can make you feel warmer during the winter. Con : The rug is prone to be messy due to the spilled coffee and sauce. And it entails a lot of work to clean it up. 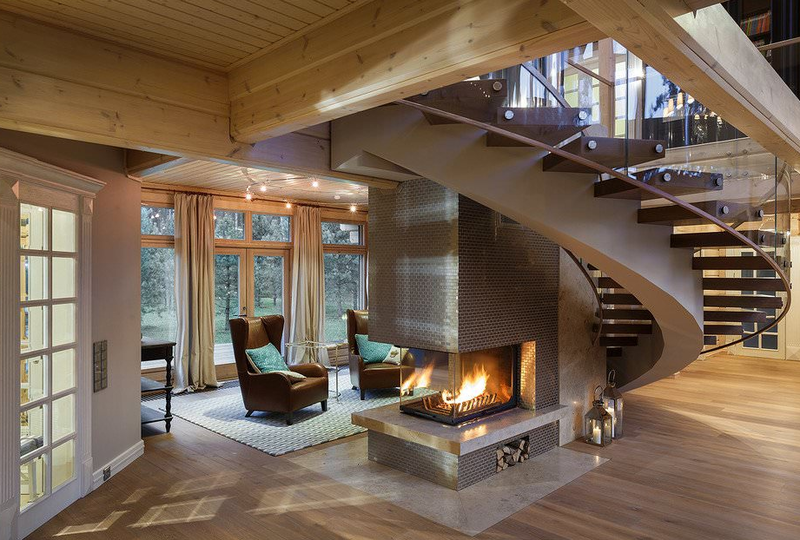 Many homeowners have taken log cabin houses to the next level. They have fused log cabin house style with modern one to create a better look. Again, wood logs are not the most indispensable thing in a log cabin house anymore. As long as you can bring nature to your home, anything will do. 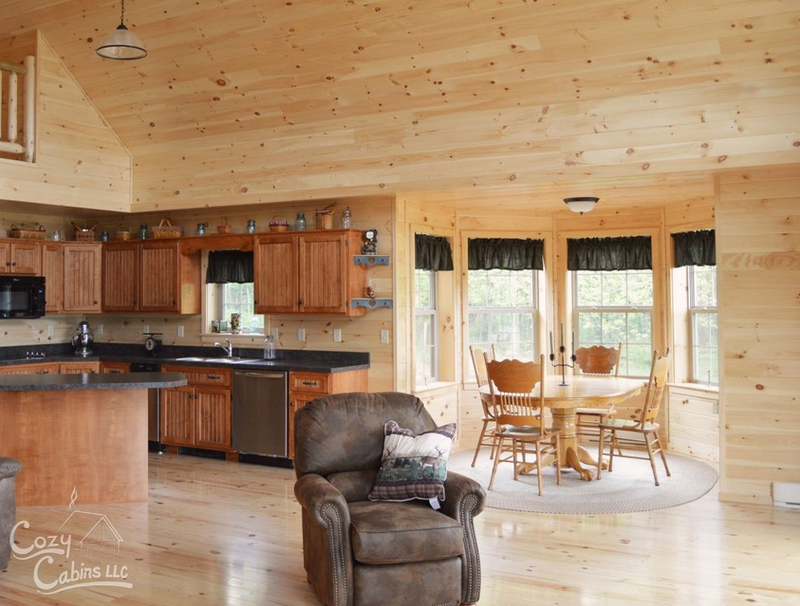 The hefty beamed and beadboard ceilings have replaced the wood logs very well. They can still bring the rustic and natural feel in this modern interior. Right in the middle of the living room, your attention will be captured by the unique yet exquisite chimney. Right above behind the chimney is the stairway. Both of them are perfect combination to accentuate the room. Have you ever imagined living in a tree? It’s not merely a dream. In fact, it can be a feasible idea. Well, yes, the log is from a tree, but not the leaves. They are merely decorative plants placed around the log so that the log will look like growing. It is important to apply certain theme to your house sometimes. But if you haven’t made up your mind yet, going for an eclectic style can be your safe bet. 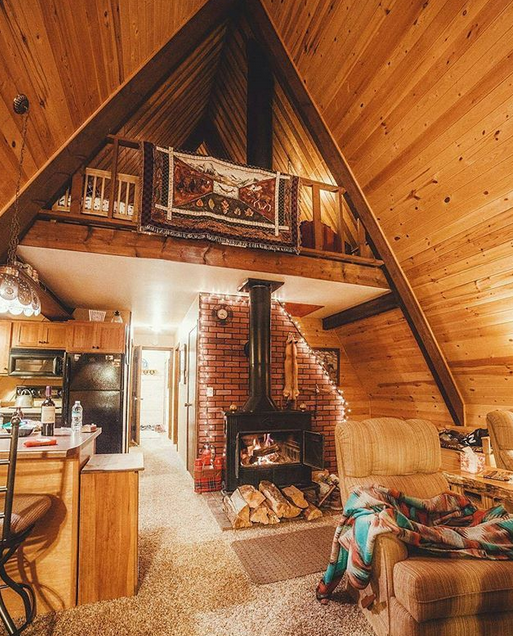 There is nothing wrong with eclectic style in a log cabin house. You just need to include wooden materials in the interior. Just like this living room, a white fabric sofa sits perfectly under the hefty beamed ceiling. 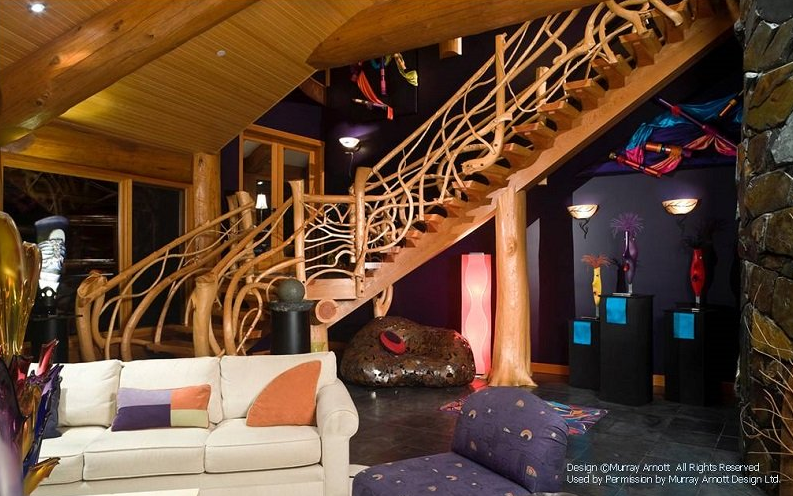 Right behind the sofa is a stairway that has distinctive handrails looking like vines. There is a small log under the stairway that supports it. The wall is painted dark blue with some adornments attached to it, making it look like the outer space with some planets and stars. Still, it looks great with the log cabin style. Invigorate yourself in this eccentric yet comfortable bathroom. All the things in this bathroom look so natural. It will make you feel like you are bathing in a forest. Wood logs are installed for the walls and the ceiling. The distressed wooden door adds a classic look to the bathroom. 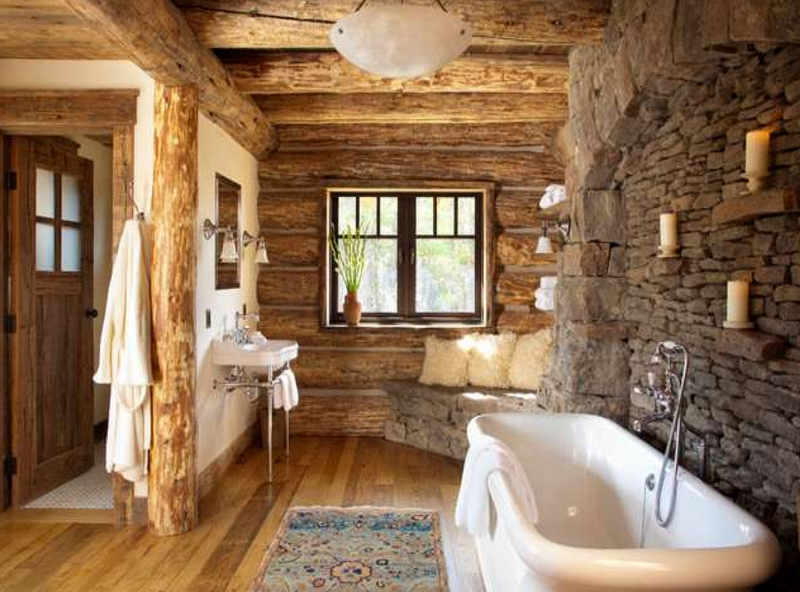 An antique rug is put near the bath tub to alleviate any splashes that can make you slip. And one thing that I love most is the backsplash made of natural stones with some candles. 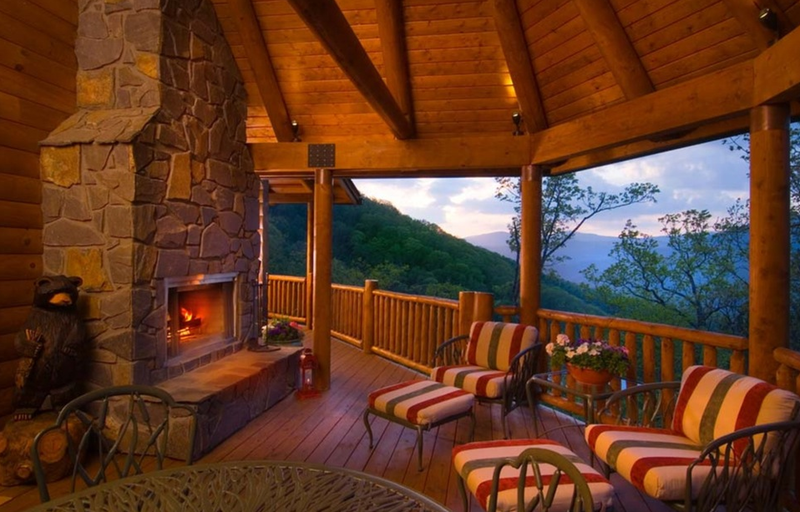 Enjoying the spectacular landscape of a mountain on a deck is always great. Therefore, the deck has to be great, too. The chimney makes a pretty good focal point where the whole family gather to catch up with each other or just lounge on the chair while lingering over the landscape. 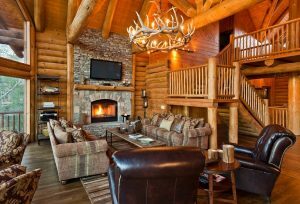 Log cabin interior brings traditional ambience to your home, but it does not mean that it is old-fashioned and not flexible. You can fuse it with any other interior that you like just like what you just found in some of the cabin log ideas you have read. Now our turn to bring nature to your home. « 9 Incredible Home Gym Ideas, It’s Time For Workout !